Today’s strikes on CIASIS in Syria involved 26 cruise missile launches from the Caspian sea, along with additional strikes from the air. QUESTION: Why would Russia use expensive cruise missiles when there is no way any legitimate ISIS could take preventive action against much cheaper airstrikes? ANSWER: Because America can warn CIA assets of approaching aircraft and tell them to take cover or leave the area. The U.S. still most likely cannot track a cruise missile, which will take care of the CIA just fine, at additional cost. And Russia can fit that into a budget of $400 billion somewhere. Russian warships joined in strikes in Syria with a volley of cruise missile attacks as Russian President Vladimir Putin pledged his air force would back a ground offensive by government forces. 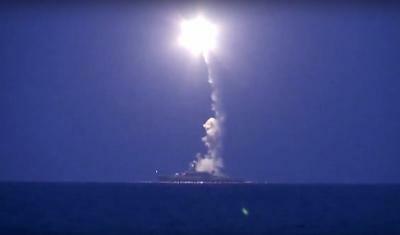 Ships from the Caspian Sea fleet launched 26 cruise missile strikes that hit 11 targets over 1,500 kilometres away in Syria, Moscow said. Putin said Russian efforts “will be synchronised with the actions of the Syrian army on the ground and the actions of our air force will effectively support the offensive operation of the Syrian army”, at a televised meeting with Defence Minister Sergei Shoigu. The Russian leader, however, also stressed the need for cooperation with a US-led coalition fighting Islamic State jihadists, saying that without cooperation from the US, Turkey and Saudi Arabia, the intervention was unlikely to work. Russian forces have struck 112 targets in war-torn Syria since last week launching a bombing campaign that Moscow says is targeting the IS group, Shoigu told Putin in the televised briefing. In a sign that Russia was ramping up its involvement, Shoigu said that four Russian warships had hit sites in Syria on Wednesday with cruise missiles. “In addition to the air force, four warships of the Caspian flotilla have been involved,” Shoigu said, adding that the warships had carried out 26 cruise missile strikes against 11 targets. A military spokesman told Russian news wires that the strikes from the warships had hit positions of IS and Al-Qaeda affiliate Al-Nusra Front.